Headboard post height 48', high footboard post height 31', Height under rail 12.5', bed dimensions 80'W x 84'L. Solid cherry, maple or walnut wood. At first glance the Vermont Furniture's bed looks simple, but a closer look reveals high-quality construction and wanted attention to the little details, such as mortise and tenon joinery and lack of exposed screws. Careful and passionate hours of work put into the construction process and these little details, make this bed more than exceptional. The extra height on the headboard present an elegant yet commanding look all while providing ample room for a comforter, pillows, and decorative linens. Present yourself with modern-day function and casual sophistication with the Easton bed. 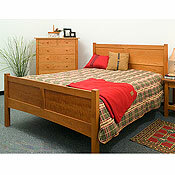 Choose low (not pictured) or high footboard, cherry, maple, or walnut wood beds in king or queen sizes. Please note: We suggest the Essex beds to be used with mattresses only (without a box spring). The slat support system, the bed frame's design and a solid foundation provides full support and function for mattresses without a box spring.